Its still hot. Of course, we’re only nearing the end of August… so we can expect at least another month (or two) of heat here in central Texas. We sigh, stay inside, and make the best of it. That being said, I got to thinking about what I could “cook” in the car this year. Over the years I’ve dehydrated fruit, mushrooms, made fruit leather, and sun-dried tomatoes. I mean, why waste the heat? 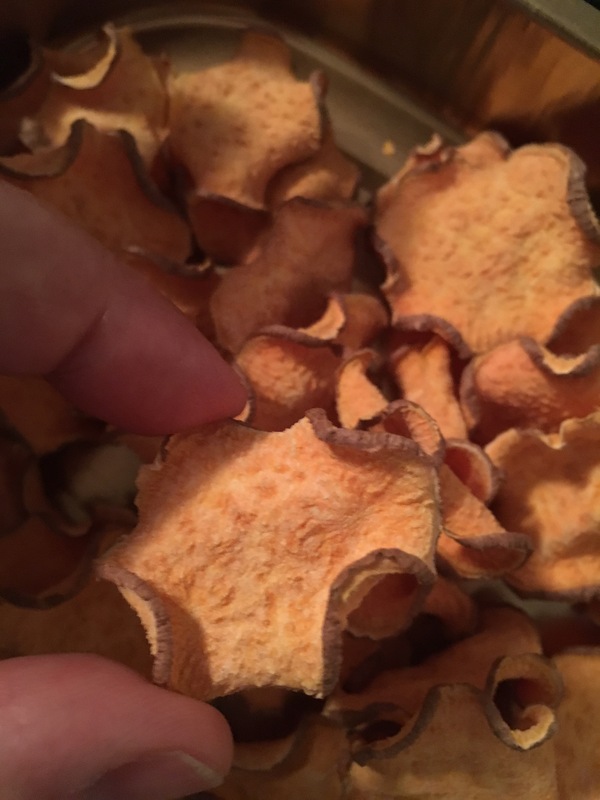 This year I was looking for something different and wondered about sweet potato chips. I love sweet potatoes but its been to hot to enjoy them as I usually do and the sweet potato chips I saw at the store all had oil involved. I wondered if I couldn’t make them at home cheaper, easier, and less caloric. 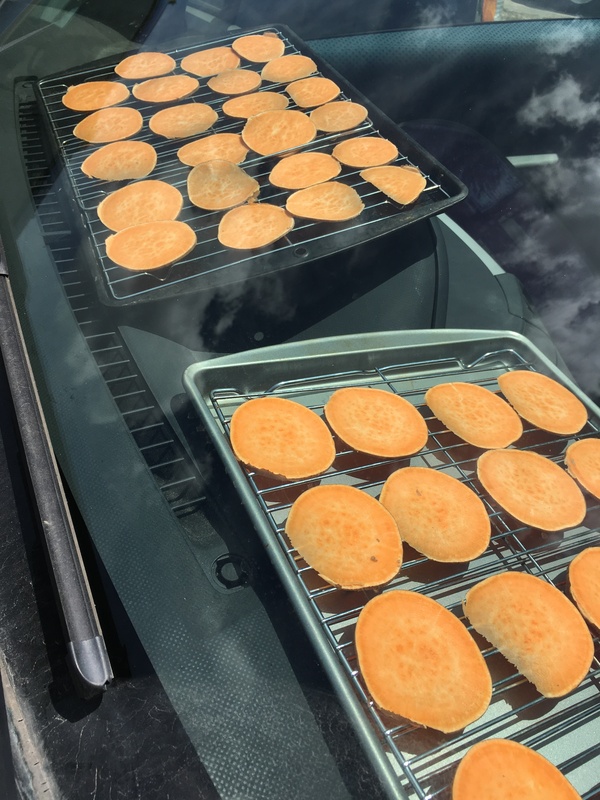 All I did was slice them thin, lay them out on cooling racks over a cookie sheet and put them on the dash in full sun. I waited until about 11 AM so the car was nice and toasty, make sure the windows were rolled up tight, and let the sun have its way. Nothing to do but wait. By 4 that afternoon I had lovely crisp crunchy sweet potato chips. Hopefully in a few months it will be cool enough to get back to cooking/baking inside without cranking down the AC. Meantime, lots of yogurt and fruit (see last month) and crunchy sweet potato chips will get me through I think. Quick question for you raw food aficionados: if you dry food in a car is it still raw?? Stay cool, be well, and hope for rain!!! « when is a soup not a soup? 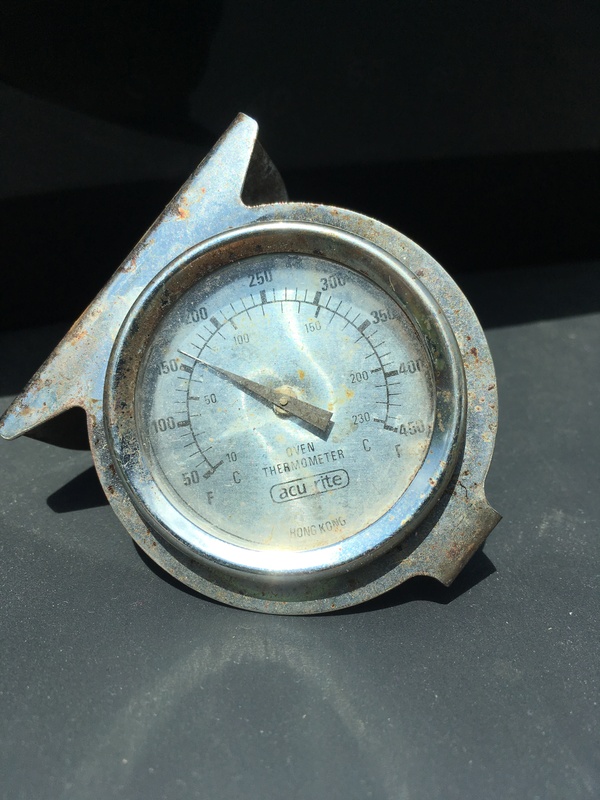 Ok, I’m not an aficionado but how could anything baking in 160 degrees still be raw? Looks yummy!